Refined materials and warm , sweet essences that blend together with class. The Roma table opens up very easily and with extensions on both sides allows to have many more guests at home. Here in the version with a black walnut top and legs in grey marble. Fixed or extendible table with wooden top available in various finishing and marble base in white Carrara, or grey. 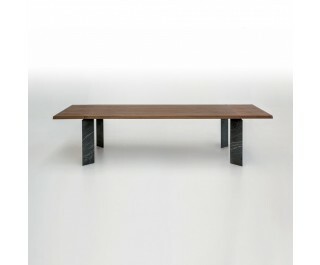 The combination of two extremely valuable materials create a table which is essential but with huge character.